Tuesday 11/29 – The California High-Speed Rail Authority is hosting a series of five community input meetings on proposed plans for HSR from Burbank to downtown Los Angeles. There are four similar meetings at various locations through December 6. If you cannot attend in person, the December 6 meeting will be available as a live webcast. Tuesday’s meeting will be from 5:30 to 7:30 p.m. at the Buena Vista Branch Library at 300 N. Buena Vista Street in Burbank. Details on CAHSR flier [PDF]. Wednesday 11/30 – Investing in Place and their partners are hosting a Completing Streets Work Group Meeting where there will be a discussion on improving L.A. City sidewalks and crosswalks, especially for access for older adults, youth, and individuals with disabilities. The meeting takes place from 1 to 3 p.m. at Impact Hub Los Angeles, 2nd Floor, at 830 Traction Avenue in the Arts District in downtown L.A. Meeting details and RSVP via SplashThat. Wednesday 11/30 Thursday 12/1 – High-speed rail meetings continue. Wednesday’s Thursday’s meeting will be at the Glendale Central Park Adult Recreation Center at 201 E. Colorado Street in Glendale. Details on CAHSR flier [PDF]. Thursday 12/1 – The final Metro Board of Directors meeting for the year will take place starting at 9 a.m. at the 3rd floor Metro board room at One Gateway Plaza (right behind Union Station) in downtown L.A. It looks like a potentially long meeting, with a new and different Metro policing contract, plus paid station parking, first-last mile intrigue, decriminalization of fare evasion, and much more. Full agenda and board reports at Metro. Thursday 12/1 – Stan’s Bike Shop, the Montebello Bike Coalition, the Eastside Bike Club, and BikeSGV invite cyclists to dress up and participate in the city of Monrovia Christmas Parade. Meet at 6 p.m. at Stan’s Bike Shop at 880 S. Myrtle Avenue in Monrovia. More details and share via Facebook event. Thursday 12/1 – FuturizeX presents The Future of Autonomous Vehicles: a forum featuring Lyft’s Emily Castor, LADOT GM Seleta Reynolds, Investing in Place’s Jessica Meaney, the L.A. Times‘ Laura Nelson, and Los Angeles City Councilmember David Ryu. The event takes place at 7:30 p.m. at the Petersen Automotive Museum at 6060 Wilshire Boulevard in Mid-City. Event details at FuturizeX. 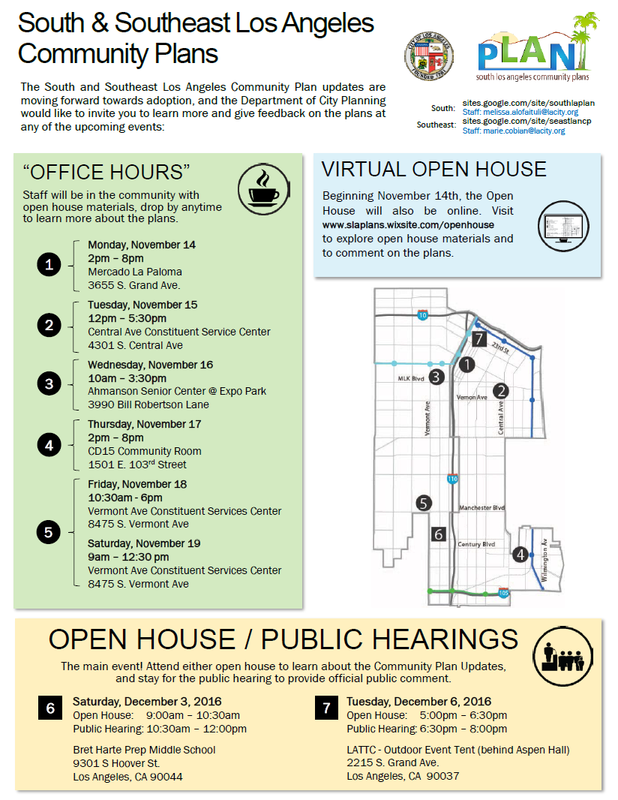 Saturday 12/3 (and next week Tuesday 12/6) – The Department of City Planning will host two open house public hearings on community plan updates for South L.A. Saturday’s meeting takes place from 9 a.m. to noon at Bret Harte Prep Middle School at 9301 South Hoover Street in South Los Angeles. Details on flier. Saturday 12/3 – L.A.’s Great Streets Initiative and Councilmember Paul Krekorian are hosting a community pop-up event on Lankershim Boulevard between Weddington Street and Magnolia Boulevard. Help plan the future of one of the San Fernando Valley’s most transit-oriented streets. The free event will feature a pop-up protected bike lane demonstration. Ride at 10 a.m. from the North Hollywood Red Line Station. Details at L.A. Great Streets flier on Twitter. Share via LACBC Facebook event. Saturday 12/3 – The City of Cudahy, County Supervisor Hilda Solis, MSRC and SCAG Go Human host Cudahy en Marcha. The free festival will temporarily transform streets into places that are safer and more enjoyable to walk, bike, skate, and roll. Experience pop-up protected bike lanes along Atlantic Avenue and safety improvements on Elizabeth Street. Celebrate the L.A. River Upper Segment Revitalization Plan kick-off with a community bicycle ride, music, live art, vendors, food trucks, prizes, crafts, a bicycle rodeo, and more. Cudahy en Marcha takes place from 11:00 a.m. to 3:00 p.m. at Clara Street Park at 4835 Clara Street in Cudahy. Get more details and share via Facebook event. Sunday 12/4 – The L.A. County Bicycle Coalition hosts a Sunday Funday ride exploring L.A.’s faith diversity. The easy 12-15 mile ride starts at 9:30 a.m. at the Islamic Center of Southern California at 434 S. Vermont Avenue in Koreatown. More details and share via Facebook event. Next Week: Monday-Tuesday 12/5-6 – High-speed rail meetings continue in Downtown L.A. and Cypress Park. Details on CAHSR flier [PDF]. Next Week: Tuesday 12/6 – South L.A. Community Plans open house from 5 to 8 p.m. at L.A. Trade Tech College (outdoor event tent behind Aspen Hall) at 2215 S. Grand Avenue in South L.A. Details on flier. High-Speed Rail, Transformative Talks, Boyle Heights joint development, and more!